Week 4 of Youth Soccer Month is all about fitness and keeping yourself physically and mentally in shape for the game. Your body and mind are the tools that you use to compete at any level you are playing at. Just like any other tool, you want to take care of them so when the time of need comes they will work most effectively. Make sure you are constantly taking care of yourself. Eating healthy, staying hydrated and getting plenty of sleep are just as important as training on the field. When the time comes will your fitness levels be where they need to be to shine? As the Director of Coaching for US Youth Soccer, Sam Snow has made a significance impact in the youth soccer world after first joining the staff in 2003 and becoming the Director in 2004. His experience and knowledge are grossed from years spent in national, collegiate and youth education. 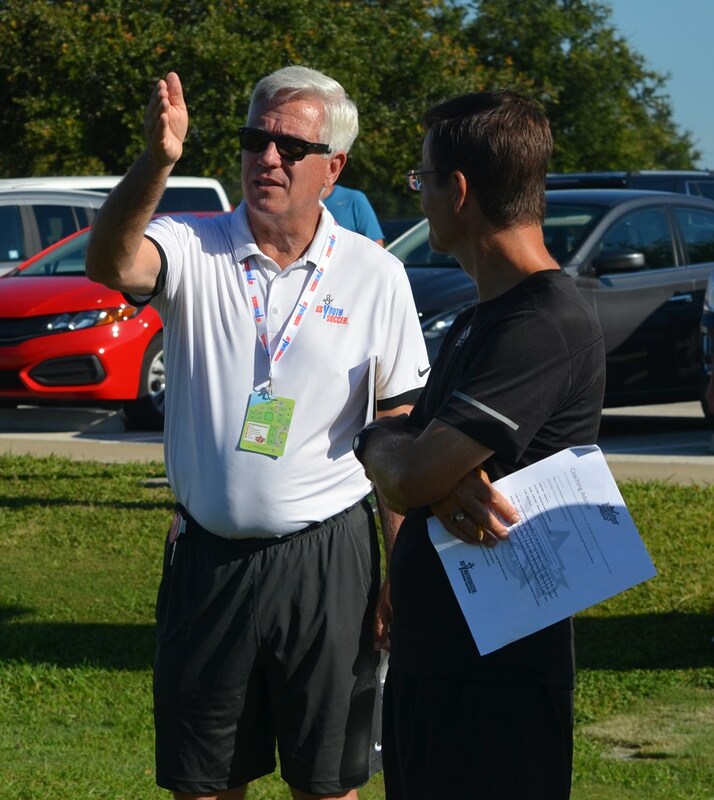 Coaching is a second nature for him, as he has coached at the high school (Norfolk Catholic High School), collegiate (Florida Southern College, University of South Florida, Virginia Wesleyan College), state (Florida Youth Soccer Association) and regional (US Youth Soccer Olympic Development Program Region III) levels. How is soccer beneficial for a fit and healthy lifestyle? There is evidence from sports medicine indicating that soccer as a lifetime sport is a healthy choice. Heart health, balance, agility and to a degree strength, are all impacted positively by regular participation in soccer. Research has shown that movement, such as when playing soccer, is linked to specific brain functioning in children. For example, cross lateral movement (a somewhat frequent movement in soccer) gets the right and left sides of the brain to work together. It helps to wake up different lobes in the brain. How does soccer help players stay physically and mentally in shape? Physically there is a positive impact in lowering blood pressure and in maintaining flexibility. Mentally the game impacts visual acuity and quick decision making in a game of high sensory input. As players begin to compete at higher levels, how does the role of fitness change when playing the game? Before puberty kicks in fitness for young soccer players is mostly about physical literacy, which gives them a solid foundation of athleticism. During adolescence, when most high performance soccer should be occurring for youth players, fitness takes on new dimensions. Once the growth spurt is complete players can put in hard work on strength, power and speed. Body composition becomes a more dominate factor in high performance play, so the right diet with the right work load is a must. The right balance of work and rest is crucially important to sustained high performance – the issue today is that too many teenagers in high performance soccer are overdoing it. They over-train and play too many matches. Regeneration training sessions and plain old time off are important factors to play the game well. What role does nutrition play in soccer? A balanced diet, which includes proper hydration, is vitally important to play well week in and week out over the course of a 6 to 10 month season – depending on the age group. The adults around youth soccer players should set the example by eating healthy foods. There is very good sports nutrition information on the US Youth Soccer website for players, their parents and coaches to download. Suffice it to say though that fast food shouldn’t be on the menu. What are some helpful messages for people to tell themselves when they are lacking motivation to work on their fitness or maintain a healthy diet? It’s hard for most people to self-motivate day in and day out to achieve their goals. We all need some help now and then. So to stay on your fitness routine and your athletic diet get a teammate or two to join you in your extra workouts. Ask your teammates, coaches and parents to help guide you in your food and drink selections. How you care for yourself off the field will directly influence your on the field performance. Build a sup[port network to help you stay on course to achieve your goals. What are your tips for a healthy lifestyle? In the end your lifestyle comes down to your personal choices. For most of us those choices are influenced by family and friends. Leading a healthy lifestyle will be easier if you hang out with people who want to lead a similar lifestyle, so hang out with other athletes from multiple sports. Why is soccer a good sport for lifelong fitness? From the study Recreational soccer is an effective health-promoting activity - The present study showed that a 12 week period of regular recreational soccer training lowered resting blood pressure, heart rate and fat percentage. In addition, in contrast to the running group, the soccer group elevated lean body mass and leg bone mass, increased fat oxidation during running and had a significant reduction in LDL cholesterol. These results suggest that the intermittent exercise with periods of near-maximal heart rates and multiple intense actions during soccer training effectively stimulates musculoskeletal and cardiovascular adaptations throughout a 3 month training period. As Youth Soccer Month comes to a close, it is important to take note of the U.S. Soccer Player Development Initiatives and the improvements to be made in the youth soccer world. Read more about the initiatives here.